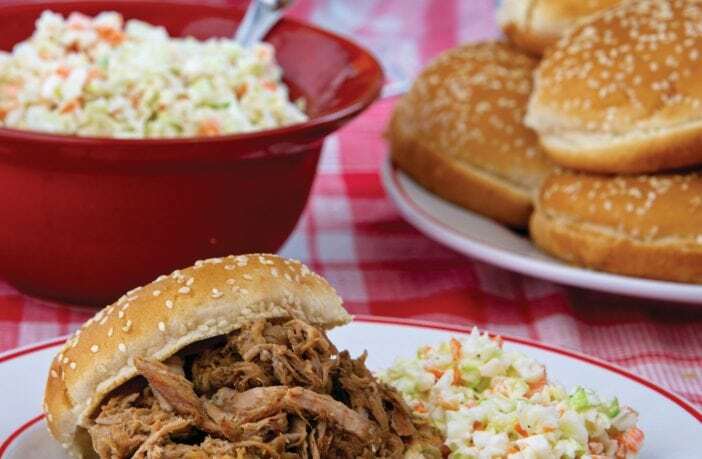 When rain dampens your grilling plans, try these summertime barbecue, sloppy Joe and chicken kebab recipes. It’s June, and the summer grilling season is here. We’re all making plans for outdoor parties focused around the grill. But what if it rains? Or what if a heat wave keeps everyone wandering back inside? These recipes work well all summer — whether you are out in the sunshine or under the air conditioner. Place the beef, onions, bell peppers, celery and garlic in a large skillet over medium-high heat. Break up the beef as it browns, and cook until there is no longer any pink in the meat. Stir in the ketchup, water, brown sugar, mustard, Worcestershire, onion powder, salt and pepper. Reduce the heat to low, and simmer 40 minutes, stirring occasionally. Meanwhile, place the split hamburger buns under a low broiler to lightly brown the insides. Remove from the oven, and top with the beef mixture. Serve warm. This is a delicious beef stew that can also be made with lamb or rabbit. Place 1 tablespoon of the oil in a Dutch oven over medium-high heat. When hot, add a third of the meat and brown on all sides, about 8 minutes. Remove with a slotted spoon to a platter (do not line with paper towels! ), and repeat twice with the remaining oil and meat. Set the meat aside. Reduce the heat to medium, and add the onions or shallots to the drippings. Cook for 8 minutes, stirring occasionally. Add the wine, cognac and vinegar. Cover and simmer for 3 minutes. Increase the heat to medium-high, and add the reserved meat, tomatoes, tomato puree, bay leaf, allspice and nutmeg. Bring to a boil, reduce the heat to low, cover and simmer 1½ hours. Halfway through the cooking, check to make sure the stifado hasn’t dried out. If necessary, add ½ cup of warm water. Also stir in the salt and pepper. Serve warm with cooked orzo. 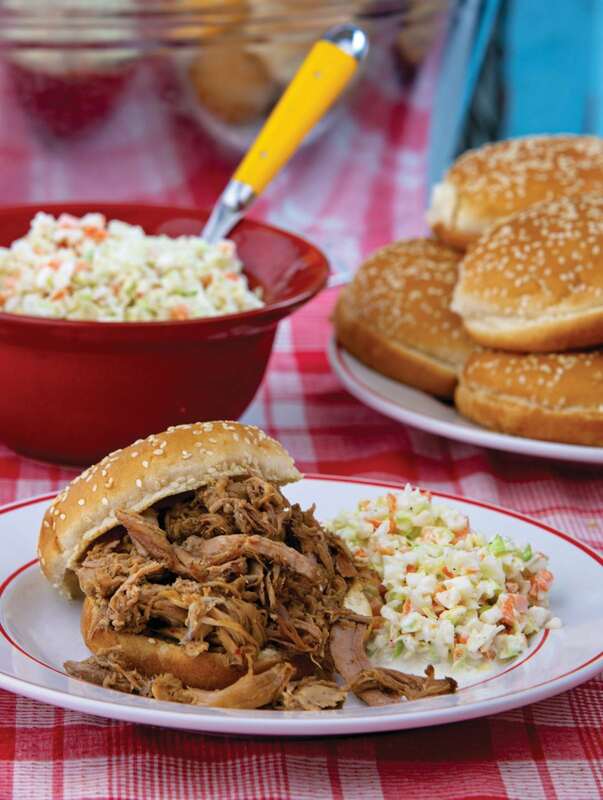 Place the pork in a large slow-cooker. In a small bowl, mix together the paprika, salt, pepper, garlic powder, dry mustard and cayenne. Sprinkle over the pork, and add the liquid smoke. Cover and cook on low for 10–11 hours (or on high for about 6 hours). If the meat is not boneless, remove and discard the bone. Shred with meat with two forks. Serve warm with the barbecue sauce of your choice. Place the oil in a large skillet over medium heat. Meanwhile, thread at least two alternating sets of pork, sausage, apple and sage on each skewer. Working in batches if necessary, place the skewers in the skillet, making sure not to overcrowd the pan. Cook 7–8 minutes, turning to evenly brown. Add the wine, and cook 2 minutes longer. Decrease the heat to medium-low, cover and simmer for 8–10 minutes. Serve warm with mustard. Preheat the oven to 450 degrees. Place the chicken with the skin side up on a rimmed baking sheet, and rub with 1 tablespoon of the oil. Sprinkle liberally with salt and pepper. Roast for 30 minutes. Meanwhile, place 3 tablespoons of the oil, 2 tablespoons of the vinegar and a pinch of salt and pepper in a 9-by-13-inch baking dish. Whisk until blended, and place the bread on the dressing mixture, turning to evenly coat. Set aside. In the bowl of a food processor, combine the basil, parsley, garlic, a pinch of salt and pepper and the remaining vinegar and oil. Process until smooth, and set aside. After the chicken has roasted for 30 minutes, place the bread around the chicken, and return to the oven for 8 minutes. Remove from the oven, and transfer the chicken to the baking dish. Flip the bread and return to the oven for 3 minutes or until golden-brown. To serve, place a piece of bread on each serving plate. Top with the herb sauce and then the chicken. Serve warm.